I like to kill 2 birds with 1 stone, and adding whey protein powder to coffee is a way to get my morning dose of caffeine along with some high quality, flavored whey protein in one mug. I need about 3 cups of coffee in the morning, so adding 1/3 scoop of vanilla flavored whey protein isolate to my morning coffee 3 times gives me about 25g of protein. 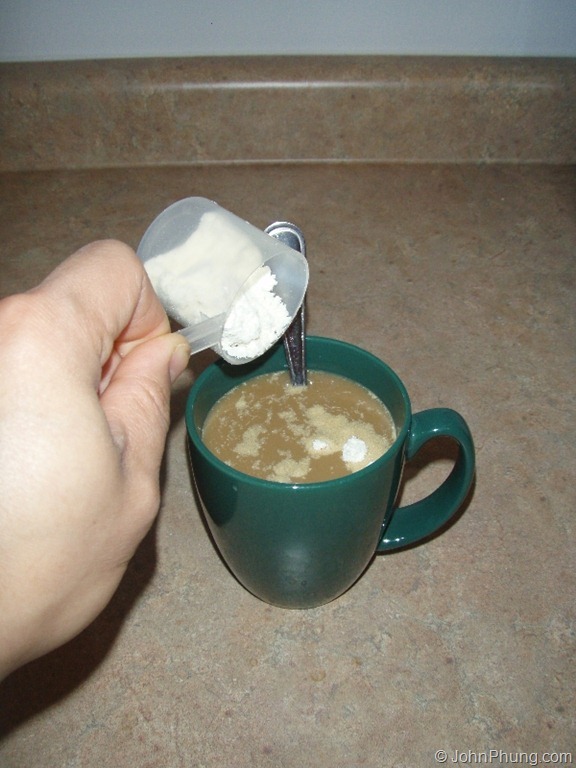 Adding up to 1/2 scoop of whey protein is fine, but I find that a full scoop makes the coffee too thick for my liking. 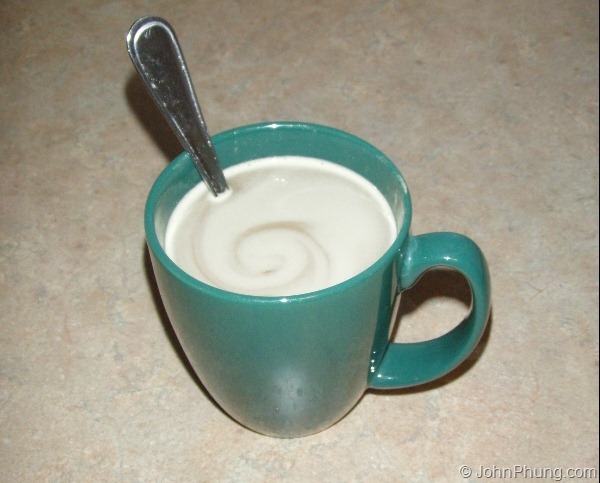 You can think of the whey protein as a protein-enhanced, flavored & sweetened coffee creamer. 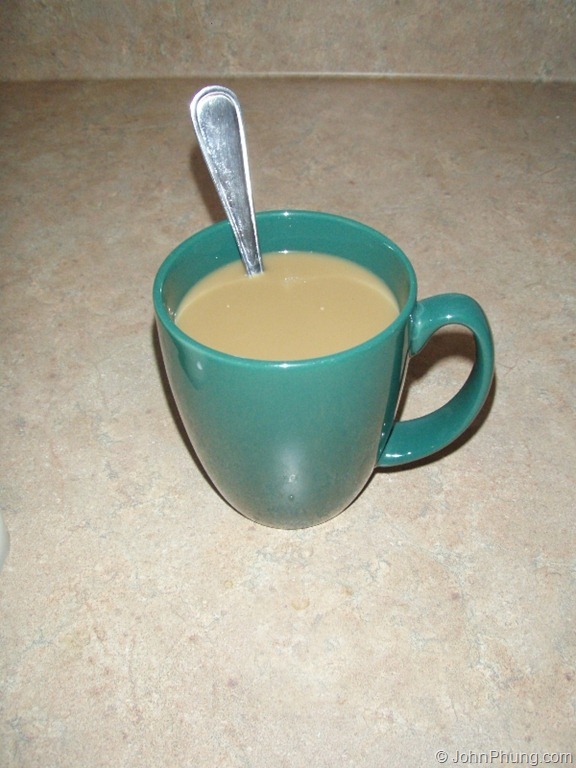 It taste a lot better than the normal non-dairy creamer such as Coffee Mate and is a lot better for you too (more about coffee creamers here). And if you’re using whey protein isolate, it’s lactose free as well. Supplement manufacturers appealed to our tastes buds and have produced a variety of different flavors of whey protein. Combined with coffee, it tastes pretty good. 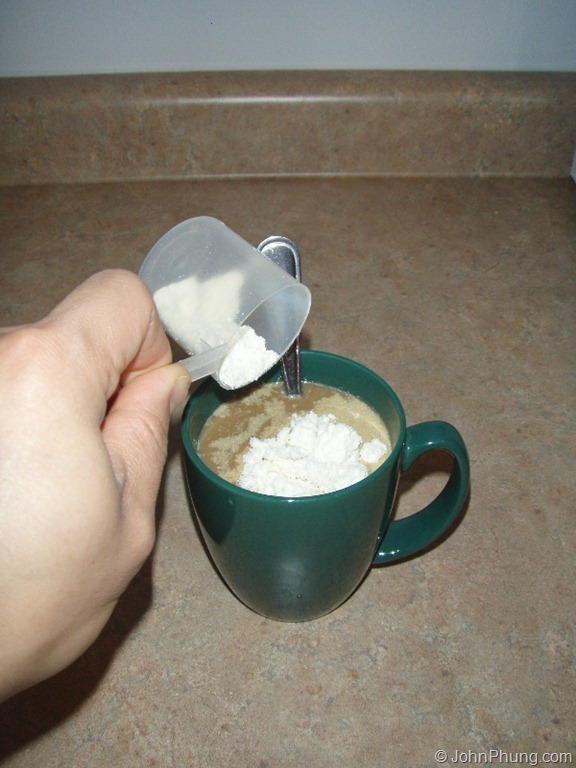 For example, adding vanilla whey protein isolate to my instant coffee tastes like French vanilla. Chocolate whey protein and coffee tastes like mocha. Personally I’ve only tried vanilla, chocolate and unflavored whey protein isolate, but @elizabethwhit20 on Twitter told me that even BANANA flavored protein tastes good with coffee! @JohnPhung tried banana myofusion..pretty good crazy as it sounds Haha! creamy! I’ll have to try that myself. If you’re like me, I drink a few cups of coffee in the morning before having breakfast. I wake up around 3:00AM and usually don’t eat until 7-8:00AM. Before this meant I had 4-5 hours without any food in my system. By adding whey protein to my coffee, I’m getting around 25g of protein first thing in the morning. 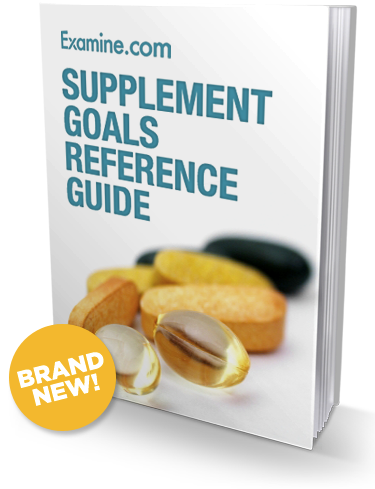 To learn more about the benefits, effects and other facts and information, you can check out Examine.com's excruciatingly thorough analysis of whey protein. The process is pretty simple. 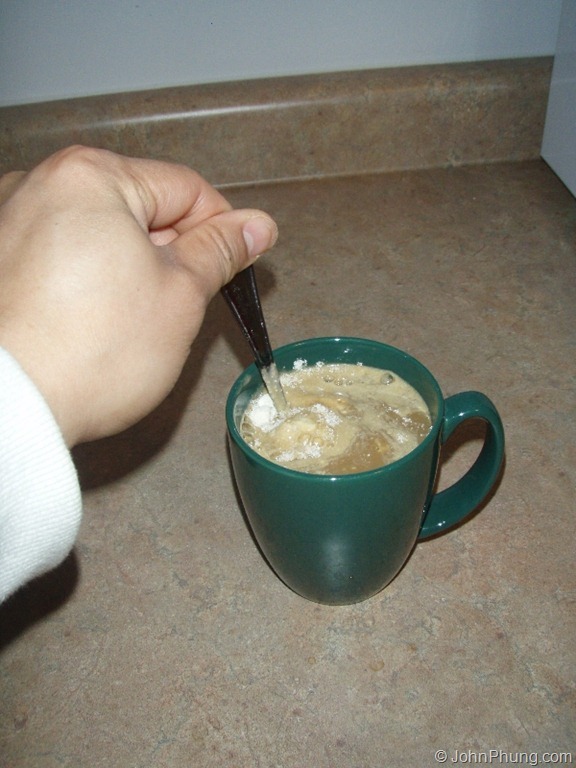 The trick is to cool down your coffee before adding the whey protein. If it’s not cooled down then the whey protein will curdle and get all sticky and lumpy once you add it to the coffee. Prepare coffee like you normally do. 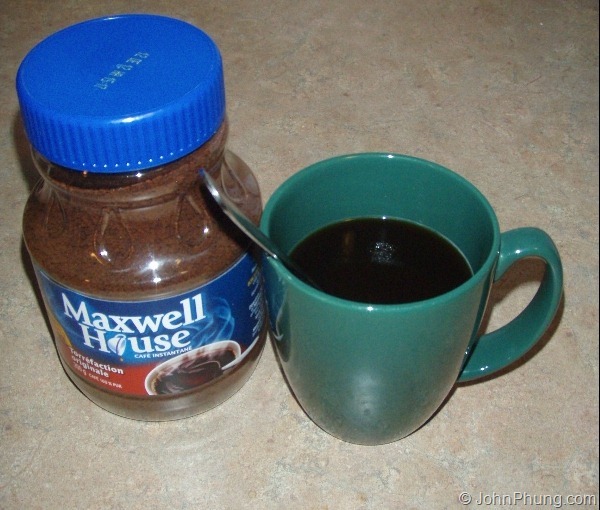 For me, I’ll add 1 heaping teaspoon of instant coffee, and half a pack of Splenda. I don’t need to use the entire packet of Spenda because the whey protein already has sweetener. Make sure you fill the mug about 3/4 to the top. You want to leave some room for the milk and whey protein powder. 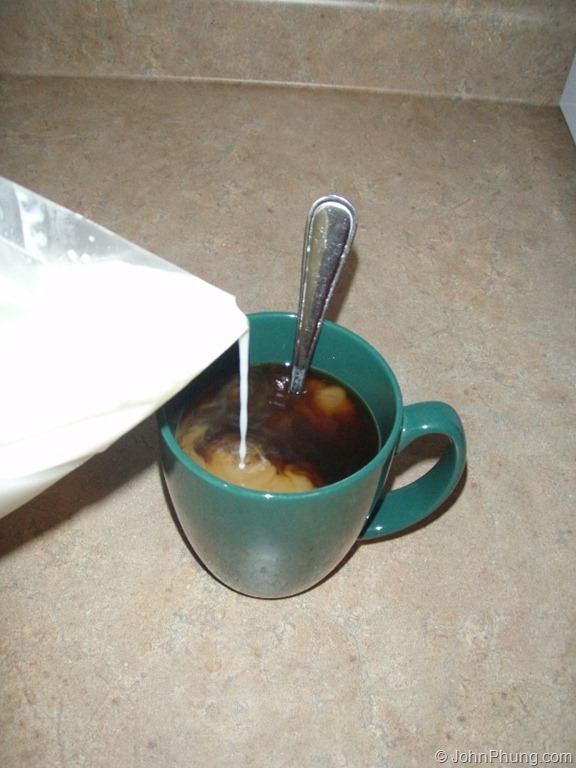 Next I add a little bit of 2% milk to the coffee. I don’t measure the amount of milk I add; I just add until it turns light brown in color. 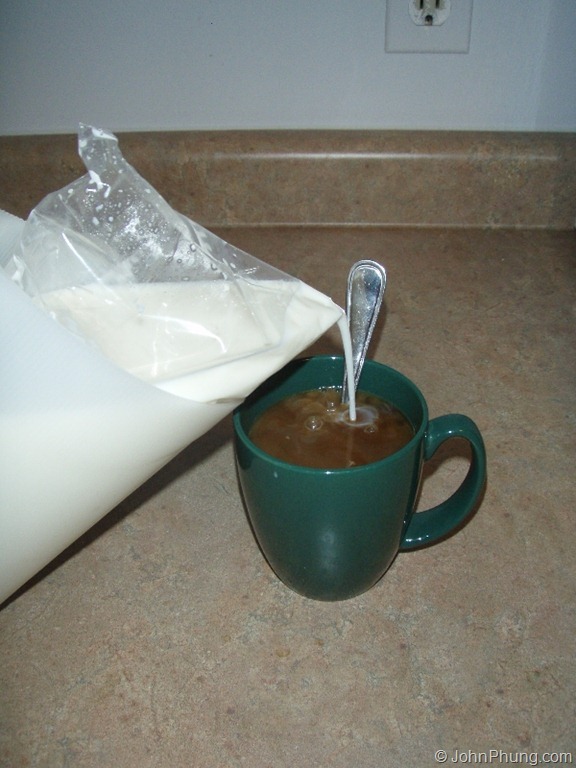 Adding the milk will cool down the coffee, but you can use cream, cold water, or just let the coffee sit for a few minutes. I use Whey-Factory.com (they've shut down since this review) vanilla whey protein isoloate, but other brands and flavors would work fine. I've tried their whey blend as well as the whey protein concentrate. Vanilla tastes good! Natural flavor does not float my boat though, so I combine it with other flavors. Mixes well and tastes good, but a little expensive for my tastes. Bought it when it was on sale before. This is the protein I'm using now. It's cheap, tasty, and cheap (I got 25% off my first order). Probably the best chocolate flavored protein I've tried in my life. They have a bunch of other flavors like banana, toffee, chocolate coconut, raspberry, cinnamon roll etc. They're big in the UK, but starting to get popular in North America based on the reviews. You can check them out here. Sprinkling it on little by little allows the whey protein to mix faster and easier, but dumping 1/3-1/2 scoop of whey protein all at once work fine too. If you want to add an entire scoop of whey protein in your coffee, mix in 1/2 scoop first until the powder is dissolved, then mix in the 2nd half. This might take a little patience, especially if you’ve added a little more than 1/3 scoop of whey protein to the coffee (which I normally do). But mixing it takes less than a minute. 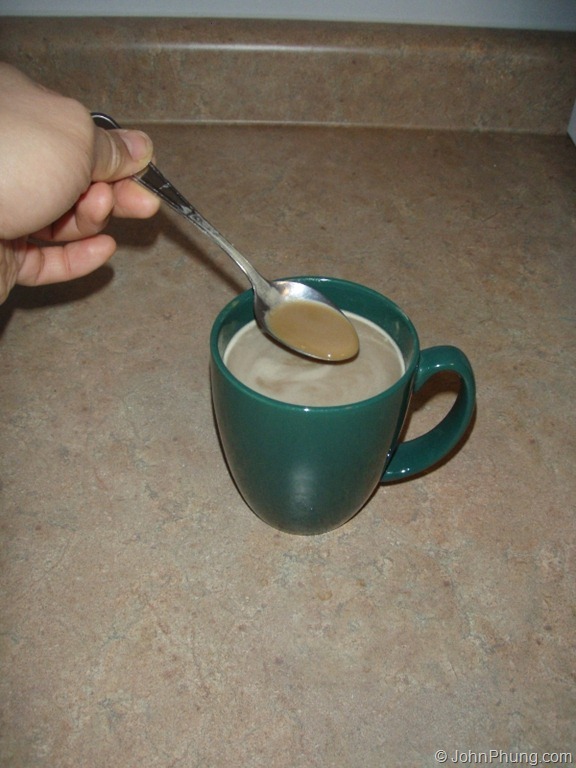 There will be some clumps, but you can use the back of your spoon to press it against the inside of the mug to break it down. Enjoy your protein-enhanced, flavored coffee! 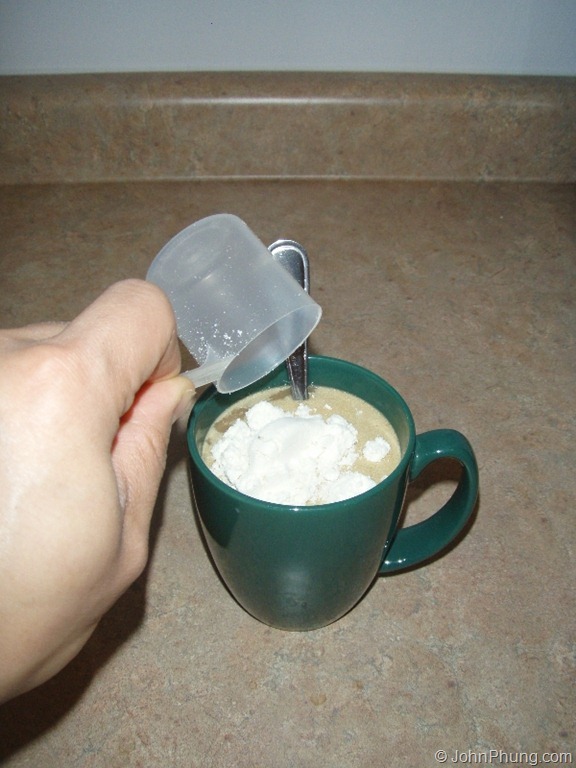 Another way of doing this is to mix the whey protein and milk first, then pour it into the coffee. 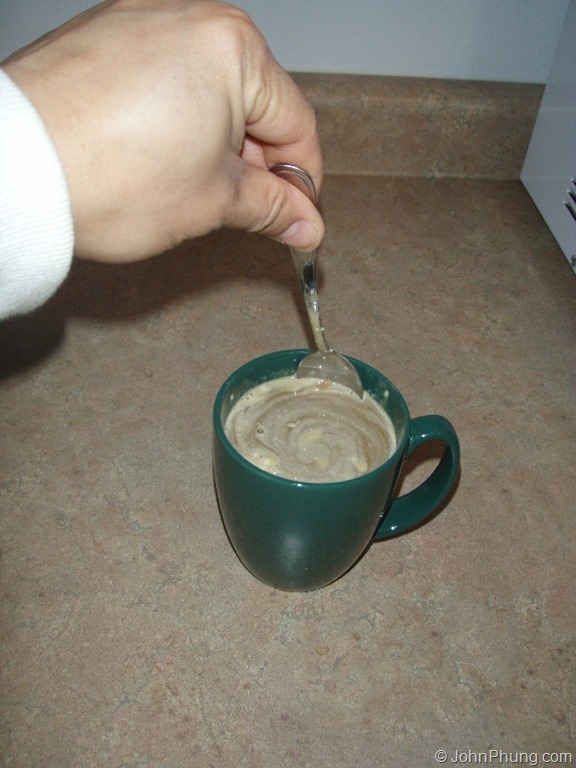 The downside to this method is that the some of the whey protein will stick to the spoon and to the mug, which will require extra hard scrubbing to remove. Steel wool makes this easy. Anyways, try it out! Adding whey protein to your coffee might become a new addition to your morning routine. If tea is more of your cup of choice, then you can add whey protein to tea as well!